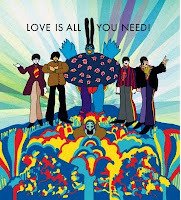 Okay, I'm sure I'm not the first person who has brought up The Beatles song, "All You Need is Love" while talking about the third theological virtue. But while preparing to write this that song just replaying itself in my head and really struck a cord. I've tried to embed the video but I'm having diffulty so you can just go here if you want to see it. Charity, according to the Catechism of the Catholic Church, is "the theological virtue by which we love God above all things for his own sake, and our neighbor as ourselves for the love of God." (1822 CCC) Loving God above all others and loving our neighbors as ourselves. What an amazing world this world would be if we did let love rule the world. I know it's very idealistic but it really is what we are called to do. The catechism just drips with scripture in the section talking about charity. I surely can't say anything that the catechism doesn't and I surely can't say anything more eloquent that what scripture says so let me just pull some of the quotes from scripture. Charity is what being a Christian is all about. We don't need government intervention--we need love. We need to take care of each other and not have Big Brother meddling in. Again, I realize that may seem idealistic but that's what we are supposed to do--to love. "So faith, hope, charity abide, these three. But the greatest of these is charity." Let's love each other and take care of each other. There is so much hatred and anger in the world. I see it every day in people killing and beating each other. But it's not just on the streets. It's not just in the hood. It's everywhere. There is anger in our churches, in our schools, in our places of work. It permeates the television and radio. We need to treat each other with love. It doesn't mean we have to agree with each other. We can debate and still love. Heck. We don't even have to like someone--there are plenty of jerks out there-myself included. I'm sure there are times Jesus looks and me and says, "Dude, you're being a jerk." But he still loves me and we are still supposed to love those who act like jerks to us. St. Augustine said, "Love is itself the fulfillment of all our works. There is the goal; that is why we run: we run toward it, and once we reach it, in it we shall fine rest." It's a simple equation really. If what Pope Benedict says is correct in his encyclical Deus Caritas Est and God is Love and All We Need is Love then all we need is God. Sing with me . . . All we need is God! (All together now!) All we need is God (EVERYBODY!) All we need is God, God, God. God is all we need. God is all we need . . .